Tsingtao MV Agusta has announced a three-strong rider line-up for their 2016 campaign with Jake Dixon and Joe Collier lining up in the British Supersport Championship, whilst Wayne Ryan will battle for the Pirelli National Superstock 600 title. The iconic Italian manufacturer will continue to run a two-rider line-up in the Supersport class with 19-year-old Dixon, who finished third In last season's standings after scoring four race wins and a further nine podium finishes. Dixon is joined by the reigning Supersport Evo champion Collier. The 20-year old dominated the class in 2015 with an impressive 14 race wins and only failed to finish on the podium in three of the 26 races during the season. Meanwhile, 19-year-old Ryan remains in the Superstock 600 series for the 2016 season after scoring his first podium in the class at Thruxton and is confident of building on his debut campaign. Dixon said: "It's been a good year for me in British Supersport: multiple race wins and podiums have showcased my ability - fortunately for me, that ability has caught the eyes of many. I'm delighted to be joining MV Agusta racing. It's such an iconic brand and I hope to be able to emulate the successes of our WWS team-mates. 2016 will be a massive adventure and one that I'm certain will bring success. I just wish it began tomorrow!" Collier said: "I am happy to be making the step up to a big team with big plans for 2016. We are coming off the back of a good year and I am looking forward to riding a new bike and getting testing underway. I am excited about the new season and I want to do the best job possible and will be giving it 110 per cent to be fighting at the front." Ryan said: "I'm really happy to be signed already before Christmas so big thanks to Dave Tyson for giving me this opportunity. I thought 2015 was going to be my last season racing, which would have been a shame after getting on the podium and running towards the front at the end of the year. I'm confident that we have the right equipment and team around us to be fighting for the podium week in week out in 2016." 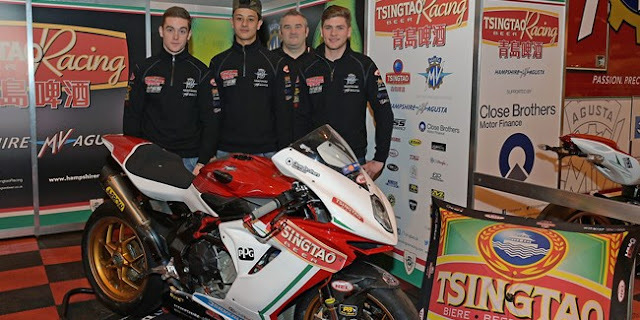 Team owner Dave Tyson said: "With direct factory backing from MV Agusta, we are in a great place to challenge for the championship next season and I think the signings we have made shows the intention from both team and the manufacturer for the forthcoming season." "I can't wait for it to start with a test with the factory team in January now with our three riders." Mark Franklin, MV Agusta Europe Managing Director said: "We are very excited the team has secured three talented riders of this calibre. After a development year that has been challenging, the package is starting to improve and will be competitive for the 2016 season. I'm sure the combination of the machine with Jake, Joe and Wayne on board will see some solid results and progress."